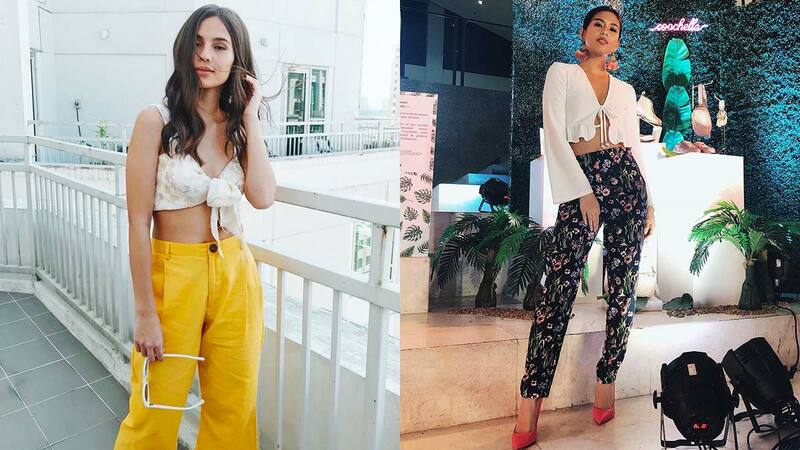 Throwback fashion is here to stay, and these styling celebs can’t get enough of this vintage, hippie piece: the 70s tie top. Maris brings on the ~flower power~ and styles her top with a leather mini, statement heels, and retro earrings. It’s the tie-front detail that actually gives Lovi’s summer maxi a carefree, la bohème appeal. While the ribbons on her top are ~barely there~, Gabbi remains chic and sleek as always, balancing the look with high-waist trousers and pointy pumps. This ‘gram-famous co-ord is a favorite of celebs for good reason: it’s luxurious yet resort-ready, easy to wear and at once a summer style statement, too. Taking beachside style to the city, Kyline wears a floral jumpsuit that features a tie-front neckline and a little peek-a-boo cut-out right below. Always sun-loving, Andrea wears the throwback top with her staples—casual jeans and wedges, sunglasses, and with her signature sunflower. A key styling tip: notice the halfway fashion Jasmine ties her top. It adds the ~effortless~ appeal to her summer look. Striped and with ruffled shoulders, this tie-front top is definitely flattering on Elisse. We love how she keeps her look fresh with a messy, high ponytail and minimal accessories.